What new superfood will, at least according to some recent studies, improve your triglyceride and cholesterol numbers, partially regress PSA and prostate cancer, protect against arterial plaque and better your omega-3 profile? If you guessed flaxseed, you would be dead on. Keep in mind also that lowering lipids and plaque will help those penile arteries stay healthy over the decades. Another way that flaxseed can do this is by lowering blood pressure, especially in those with higher blood pressure levels. In fact, that is an understatement: flaxseed, according to the latest study on men and women with hypertension, dropped blood pressure like a rock. Systolic and diastolic blood pressure decreased by an average of 15 and 7 mm, respectively. These are huge drops and as good as almost any medication out there. And what are the side effects? Better cholesterol and less arterial plaque! Seriously, I do not know of any side effects. Perhaps someone can have a rare allergy to flaxseed - I don't know. And I supposed that someone already on hypertensive medications could lower their blood pressure too much potentially, so discuss with your doctor if that applies. But what a contrast with modern pharmaceutical blood pressure medications, which are known for fairly frequent and nasty side effects. And I am sure that the number of physicians that would recommend flaxseed as a natural solution are few and far between,, which, of course, is a tragedy, because hypertension is very common in modern societies, since it is so often part of developing prediabetes or Metabolic Syndrome. It should also be noted that high blood pressure is a huge risk factor for developing plaque and erectile dysfunction. Most physiciains are simply not aware of the many natural cures for high blood pressure that are out there. In my page on Natural Ways to Lower High Blood Pressure, I point out some of them, many of which are just as powerful as flaxseed. On the same playing field are Vitamin C and garlic, citrulline and high-nitrate foods for example. Again, check with your doctor if you are on existing medications, but you should be able to use some natural solutions and likely lower the dosages of any hypertension drugs you are currently using. We have had men on The Peak Testosterone Forum with resistant hypertension - the worst kind of high blood pressure out there - actually do just this. The uncertainty of the causal effect behind flaxseed's superpowers may bother some, bu the main takeaway in my opinion is that, because flaxseed works through so many different mechanisms and pathways, it is likely to provide synergies, i.e. additive effects, to almost any nitric oxide boosting strategy that you have already implemented. This would range from PDE5 inhibitors to citrulline and high-nitrate foods for men with prehypertension or hypertension. BONUS FOR MEN ON HRT: Stop and think about the things that can pull you off of HRT (TRT). The likely problems are high blood pressure, high PSA, prostate cancer and high hematocrit. Flaxseed has research behind it saying that it can protect you in 3 out of 4 of these conditions. It also can protect you against BPH (enlarged prostate) according to one study. 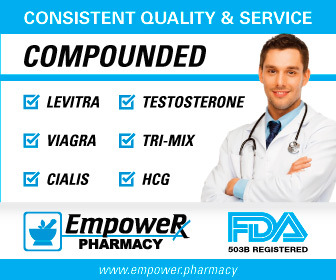 Admittedly, an enlarged prostate would probably not take you off of HRT, but I have heard that it can happen due to the increase in DHT that results from testosterone therapy. And, if you are on topical testosterone, your DHT may be disproportionately increased. WHAT HAPPENS IF I AM HEALTHY? If you already have normal blood pressure to begin with, don't expect flaxseed to make much, if any, difference. That is exactly what one study showed on healthy subjects, i.e. blood pressure was not altered significantly one way or the other. Again, though, flaxseed's anti-inflammatory and lipid-lowering powers coupled with the fiber is likely to help even healthy subjects that experience no decrease. NOTE: Some of you may have read that flaxseed is high in phytoestrogens and that is true. However, I have taken it for a year now with no ill effects. Clarence Bass, the famous bodybuilder and trainer, has taken it for many years. And a number of men on the Peak Testosterone Forum also have taken it with nothing but good reports to date. I know of no downsides at this point and nothing but huge benefits. You can also read the research in my page on The Benefits of Flaxseed for more information. 1) Hypertension, 2013, 62:1081-1089, "Dietary Intervention Potent Antihypertensive Action of Dietary Flaxseed in Hypertensive Patients"
2) J CARDIOVASC PHARMACOL THER, Jan 2005, 10(1):23-27, "Effect of Flaxseed Consumption on Blood Pressure, Serum Lipids, Hemopoietic System and Liver and Kidney Enzymes in Healthy Humans"
3) J Med Foodm 2008 Junm 11(2):207-14, "Effects of dietary flaxseed lignan extract on symptoms of benign prostatic hyperplasia"